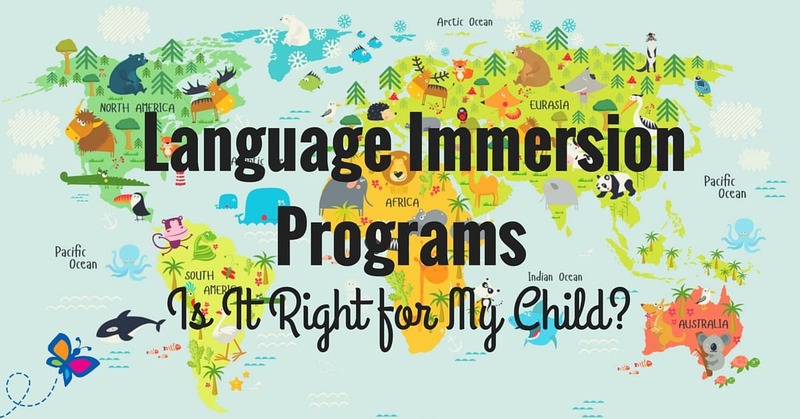 Language Immersion Programs – Is It Right for My Child? For those parents who live in an area where language immersion programs are offered, it may be difficult to make the choice as to whether or not their kids will benefit. Here is a list of some questions to consider, and some pros and cons based on the experiences of others and the nature of immersion programs themselves. First of all, just what is a language immersion program? This refers to a type of learning that involves total immersion in a foreign language. A variety of subjects are taught in the language, rather than teaching the language as a separate subject. In other words, your child won’t have Spanish, French, German, etc. class; he or she will have math, social studies, etc. class taught in the foreign language. The language being learned is spoken almost all the time during the program. 1. How does your child deal with his or her native language? If your child struggles with language concepts, you might want to consider the possibility that a foreign language could be very confusing. 2. How important is learning a foreign language to your family? You may have special reasons for having your child learn a foreign language, such as your location, relatives, or friends. Learning about another culture may be important to you as well. 3. Is your child an experiential learner? Some children learn best on paper; others by experience. In language immersion, your child will be experiencing the language first-hand. This really appeals to some children and helps them learn the language easily. Children tend to become fluent in the language, even if it’s not spoken at home. A child’s understanding of his or her native language may be enhanced, as he or she begins to see the roots of English words that are present in many foreign languages. Language immersion may make it easier for your child to learn other languages in the future. Children with dyslexia or other language-based learning disabilities are purported to have trouble with this type of language program. The “sink or swim” approach, where your child is “forced” to learn the language to survive the class, can be intimidating to some kids. Terminology in the subjects taught in language immersion programs, such as math, may present a problem for some kids when they are presented with those terms in their native language.